Move over, Jesus. 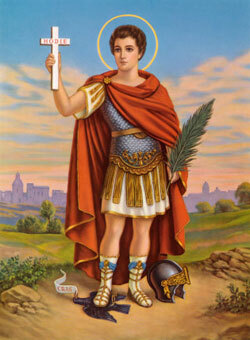 This Easter weekend has a new hero in town: St. Expeditus. Patron saint of the micronation the ‘Republic of Molossia‘, Expeditus is known for all things temporal. He lends a helping hand in emergencies; offers expeditious solutions; is patron to merchants, navigators, students, examinees, programmers, hackers, and revolutionaries; and, most importantly, this guy protects against procrastination. His feast day, should you choose to observe it, is April 19th. Though his death is posited as 303 A.D., Expeditus seems to have really leapt into being in the 18th and 19th centuries—a late-coming almost too befitting for his purpose. His story involves everything we love: postage, puns, nuns, and procrastination. On Saturday—his day—we’ll be celebrating him. In his first recorded mention (in the Martyrologium Hieronymianum, a martyrology attributed to St. Jerome), Expeditus is named on both April 18th and 19th, placed first among a group of martyrs from Rome, and then with a group from Armenia. In both instances, however, it is believed that the introduction of Expeditus to the list of martyrs was merely the result of a copyist’s error. Nevertheless, as with all things too good to be true, the legend of Expeditus has been constructed around him. One story—our favourite—places the origin of the cult at a convent in Paris. In 1781, a package containing unidentified relics and statutes that had been unearthed at the Denfert-Rochereau catacombs in the city was delivered to the nuns of a nearby convent. Not knowing anything about the martyr to whom the relics belonged, the nuns did what all of us would do: they checked the box for instructions. Lo, the box was marked expedite: the remains must be St. Expeditus! (Forget that expédite is “sender”, please—I’m telling a story.) When their prayers to the new martyr were answered with lightening speed, the cult of Expeditus spread with equal haste across France, and then to all of Christendom. While you wait for the urban legend bells to subside, spare a thought for some nuns duped by express delivery. A similar story places Expeditus in New Orleans: Our Lady of Guadalupe Chapel received a shipment of numerous statues, only one of which was unlabelled. Residents there, like the nuns, took the ‘expedite‘ written on the crate to be the unidentified saint’s name. So, ‘one of New Orleans’s most popular saints‘ was born. Over in Louisiana, the statue named Expeditus is bribed with sweet cakes and flowers to this day. While we might doubt his heritage (and his miraculous credentials), we can certainly get on board with Expeditus’s iconography. Tradition holds that when Expeditus decided to convert Christianity, the devil, in the form of a crow, attempted to make him defer. Perhaps unsurprisingly, the cry of the crow—”caw” in English—is rendered cras in Latin: “tomorrow”. Ever expedient, Expeditus trampled upon the bird and killed it. “I’ll be a Christian today!” he proclaimed. (Take that, feckless Augustine.) Today, then, if you ever spot him you’ll find Expeditus, “cras-ing” crow underfoot, thrusting forth a cross inscribed with the word hodie: “today”. So while you’re chowing down on your eggs this weekend, maybe even patting yourself on the back after a successful 40-day stint of will-power, don’t let the holiday drag you into a long-term slump. When it comes to returning to work, don’t do a Jesus—you can’t afford another three day rest before resurrection. Kick that crow, and go with Expeditus.